Find out the number of bags or bales required to fill your containers. Step 1: Select your container and size. Step 2: Use the keypad to enter the number of containers of your size. Step 3: Choose either 2.8 CF Bags or 3.8 CF Bales. Find out the number of containers your bags or bales will fill. Step 2: Use the keypad to enter the number of bags or bales. 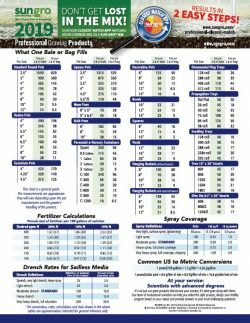 We have conversion tables for Fertilizers, Spray Coverage, Drench Rates and Common US to Metric Conversions – on a single print out.